5 clans wander throughout ancient terrain in search of security. Every once in a while they build their huts together. This is how the first villages developed. But the peaceful appearance can be deceiving and, according to some very simple rules, an unusual tactical contest develops regarding supremacy of the clans. You can see the gameboard divided into 60 areas with different terrain: mountains (gray), forest (dark green), steppes (yellow) and grassland (light green). Rivers and lakes group the areas into 12 regions (which are only important for initial distribution of huts at the start). An epoch chart is also displayed to the bottom right of the gameboard. This shows 5 epochs, I - V, one after the other from top to bottom, as well as which terrain type in each epoch is favorable and which is hostile to life. Above the epoch chart you can see the current points. There you can see the participating players and also the points for each of the 5 clans. 1 hut is placed into each of the 60 areas. In order to ensure an even distribution of colors, first 12 groups of 5 huts composed of 1 hut in each color are made. One group is put into each region. Then one of the 5 huts in the group is distributed into each individual area in the region. Each player is assigned one of the five clan colours that is kept secret from the other players until the end of game scoring. The 12 bonus chips are placed on the corresponding spots of the epoch chart. A start player is randomly determined, then play in seat order (at a desk in clockwise order). Throughout the course of the game, each player tries, as inconspicuously as possible, to collect the most points for his clan color. You get points for your color with the formation of each village, so long as at least one hut of your color is represented. Additionally, a player who establishes a village on his turn gets a bonus chip (= one point). Thus, it is desirable to establish many villages, preferably ones where your color is represented. Villages are more valuable the more huts they contain. But, beware - villages established in areas which are hostile to life in an epoch get no points and individual huts can vanish from a village if a dispute occurs. There is only one possible type of movement in the game: all huts in one area are moved into any one adjacent area which may not have been unoccupied. In this way, more and more areas become emptied, while groups of huts are concentrated in other areas. If a group is composed of 7 or more huts, it may not be moved. Huts from adjacent areas can still be moved in to join this group, however. Movement across rivers is allowed but not across lakes. In the rare case where multiple groups of 7 or more huts are adjacent to each other, the smaller group must be moved to join the larger. If both groups are the same size, the active player decides which group is moved. The last move of each player can be viewed by pressing the mouse button on the player's information box. As long as the mouse button is pressed the source and the destination area are marked by red coloured borders. The game extends over 5 epochs, as displayed in the epoch chart. In each of the first 4 epochs, one of the 4 types of terrains is particularly well-suited to the establishment of villages (the terrain depicted on the left of the epoch chart, e.g. forest in the 1st epoch). Another type of terrain is hostile to life (the terrain depicted with a ruins on the right of the epoch chart, e.g. mountains in the 1st epoch). The other terrains are neutral. In the 5th epoch, all terrains are favorable. A village established in a favorable terrain scores additional points equal to the number shown on the epoch chart, e.g. 2 in epoch II. If a village is established in terrain that is hostile to life, it earns no bonus points or any other points. In each epoch, the number of villages to be established is equal to the number of bonus chips placed in that epoch on the epoch chart (4 in the 1st epoch, 3 in the 2nd epoch, etc.) Each player who establishes a village gets the topmost bonus chip. When the last bonus chip for an epoch is taken, the next epoch begins. 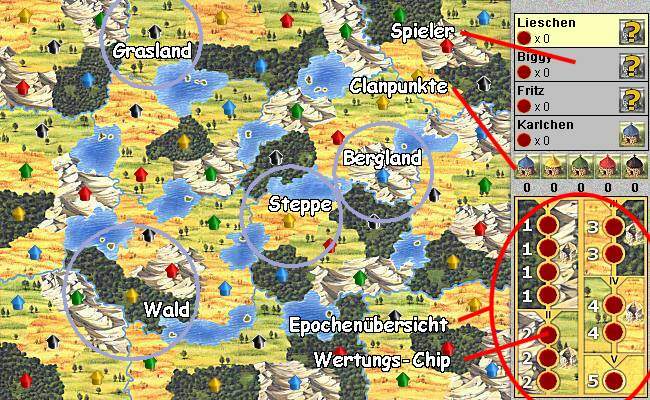 If 2 villages are established on the same player turn but only one bonus chip is left in the current epoch, then one of the villages is actually established as the first village in the next epoch. The active player decides which village belongs to which epoch. This rule also applies if more than 2 villages are established in the same player turn. 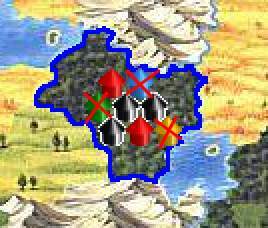 If both the 12th and 13th villages are established on the same (last) player turn, that player also decides which of those villages was the 12th and is thus scored. A group of huts (or even a single hut) becomes a village as soon as, at the end of any player turn, the area they are in is surrounded only by unoccupied areas. The player who established the village (by the actions of his just completed turn) gets the topmost bonus chip from the epoch chart. Each bonus chip counts as one point for the player holding it at the end of the game. The player who established the village gets the topmost bonus chip. The points for the clan colours represented in the village are added to the clan points. The next player then takes his turn. 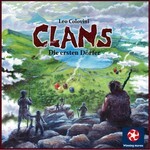 The clans normally manage to live together in a group quite peacefully - but there ia an exception: if all 5 colors are represented in a village when it is established, there is first a dispute. All colors represented in the village by only one hut are removed before the village is scored. Thus, it can also happen, that each of the 5 colors is only represented by 1 hut, so no hut for the scoring is left. Generally, when a village is established, each clan color gets points equal to the total number of huts in the village - whether it is represented by one or several huts. When the village was established in an area with favorable terrain, the village also gets as many bonus points as indicated on the epoch chart. In an area with hostile terrain, the village gets no points, neither for the huts nor any bonus points. However, the player who established the village does get the bonus chip from the epoch chart. A village's score is equal to the total number of huts plus bonus points. This total is added to the clan color's points. The game ends when the 12th village is established. Scoring for the 12th village takes place as normal and the points of the involved clans are added as normal. In the rare case that no legal moves are possible before the 12th village is established, the game ends early. Now the players' secret clan colors are revealed, and each player receives as many points as his clan color has made plus one points for each bonus chip he earned for establishing villages during the game. The player with the highest score wins. Here you can find additional tactical hints (only in German).